CBS took the opportunity to release the first teaser to Jordan Peele’s reboot of The Twilight Zone during the Super Bowl. In a mock television broadcast disruption, the teaser followed the signature style of the original series. First, the reception seems poor as it appears the broadcast is returning from a commercial break. Then, it cuts to black with text claiming that CBS is “off the air.” Then, the commercial shows an empty stadium, with a voiceover stating “Witness an empty space filled with thousands of screaming people.” The camera cuts to increasingly closer shots of the field, then finally to Jordan Peele, who walks towards a door in the center of the field. There are several versions of himself around the stadium. The narrator, who is Peele tells the viewers he is “a man nowhere and everywhere at the same time.” Before Peele walks through the door, he posits to viewers, “When the truth is not the truth, what dimension are you even in?” in an iconic signature moment of The Twilight Zone. The camera pans to the other side of the door to show Peele disappeared. 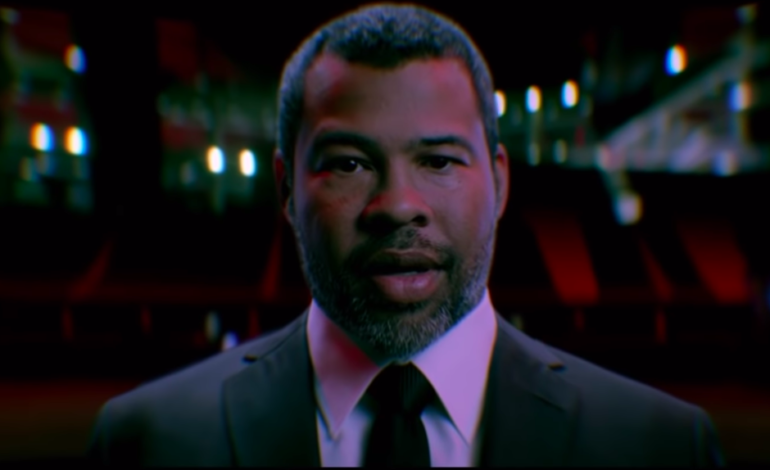 Although no actual footage of the series has been released, the teaser places Peele as the new Rod Serling, showing that the new series will be in keeping with the original in many ways. The commercial itself was shot a month before the Super Bowl in the Mercedes-Benz Stadium. In addition to this series, CBS All Access also ran commercials during the Super Bowl for Star Trek: Discovery, which is now in its third season. The Twilight Zone reboot will premiere its first two episodes April 1st on CBS, and will be available on demand for CBS All Access subscribers every Thursday starting April 11. It will be produced by CBS TV Studios and Peele’s own Monkeypaw Productions as well as executive producer Simon Kinberg’s Genre Films.